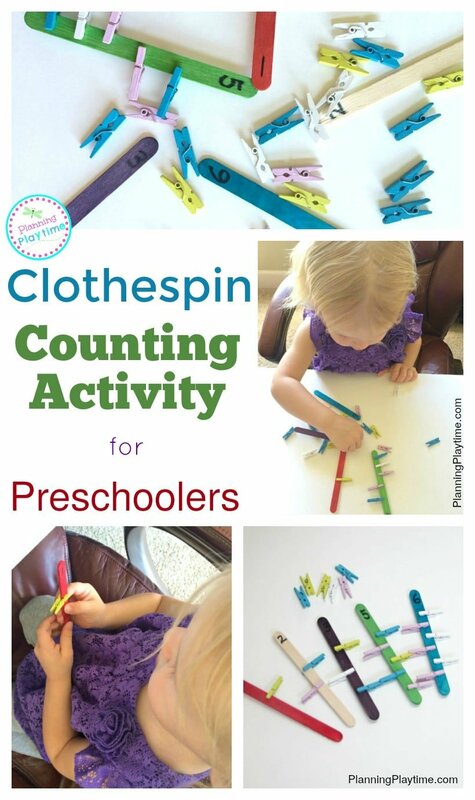 Counting is something we’ve been working on a lot at our house, and today I am sharing our clothespin counting activity for preschoolers with you. My 4-year-old is counting quite well at this point, but my 2-year-old is just starting. 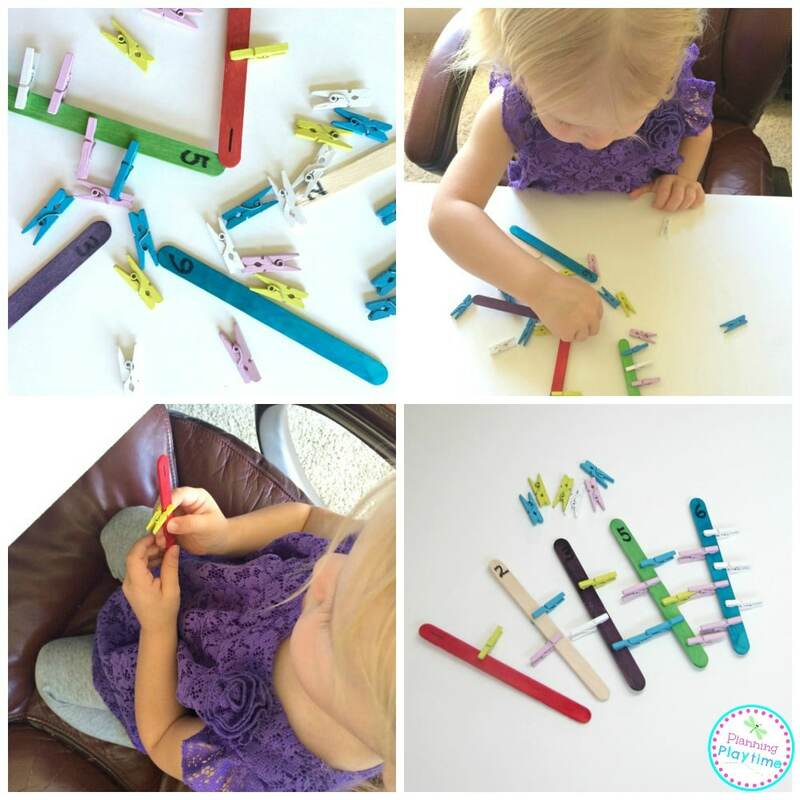 This clothespin activity is fun because it can work for a variety of ages, and it exercises some fine motor skills as well. The supplies for today’s preschool counting activity came from my favorite dollar store. I stock up on the colored popsicle sticks every time I walk in the door, because they always seem to be disappearing from the craft box. A new find this trip though was the adorable miniature clothespins sold by the sack. Larger clothespins would work too, if you are counting to numbers under 10, but these tiny ones gave us more freedom to travel up into higher numbers if needed. Also, they are just so little and cute. The bright colors always make them more fun as well. I took a sharpie to a few of the popsicle sticks, writing the numbers I wanted my toddler to practice. Then I gave her a pile of the clothespins. She went right to work pinning the pins onto her sticks. It was a lot of fun to watch her work. The tiny pins required some coordination from those little fingers, but she absolutely loved it. Once she’d finished the number from one stick we’d head onto the next one. The colorful clothespins provided a great opportunity to work on colors at the same time. I always love saying the color names while touching or pointing at something in that color. She is still convinced that pink is called purple, but we’re working on it. When she’s a bit older we could start introducing patterns to this activity as well. You would just choose a pattern to pin as you count. I LOVE it! What a great idea. I’ll have to try that as my preschooler starts his addition. This is such a simple yet brilliant idea. I love that the kids are building fine motor skills while they learn to count.